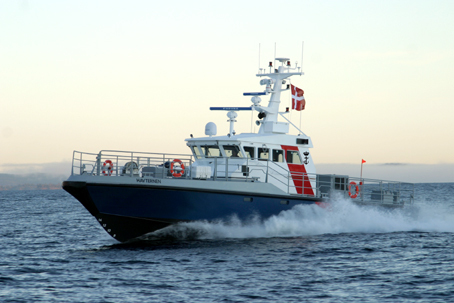 For almost two decades, Dockstavarvet has been supplying Pilot Boats to the Danish Pilot Authorities. The MC-versions back in early 1990ies are of Murray Cormack design, whilst the AP-versions are of Dockstavarvet design. 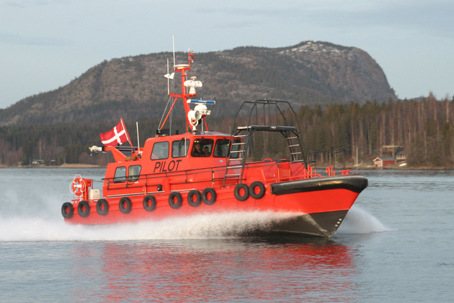 All Pilot Boats are propeller-driven except STARKAD and TRITON which have waterjet propulsion. The AP 14000 is 13.9 m long with a beam of 4.6 m. The AP 14700 is 14.7 m long with a beam of 4.65 m.
Copenhagen Airport Kastrup ranks 17th in Europe and 56th in the world. In 2006 they will have to be able to cope with even larger aircraft than today. Singapore Airlines has already ordered a number of the new Airbus A380 for 600 passengers and they will use them at Kastrup. 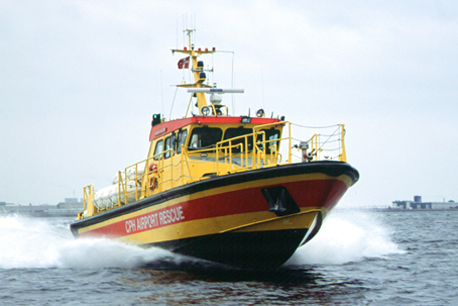 An old fleet of rescue vessels caused the authority to decide upon the new Rescue Vessel from Dockstavarvet. The craft is configured to carry up to 13 units of 50 person inflatable life rafts in quick-release mounts, according to IATA regulations. For fire-fighting purposes, a Ruberg 2000 l/min fire pump is fitted with a combined monitor and foam-mixer arrangement on the fore deck. The pump capacity can also be diverted to a sprinkler arrangement on the wheelhouse top for self-protection if there should be burning oil on the surface of the sea.